The structure of the cabin and also the roof of this XXL-version will basically stay as it is. This is illustrated by the position of the upper front marker lights, which stay exactly in the same place as they used to be – unlikely if the roof was a new development. Still, the big MAN cab is one of the largest on the market with regard to interiour volume, so there is no need for a bigger change. Total stowage inside the cabin will obviously improve with the lower windscreen, if the latter is not just camouflage. Most likely, the dark windows in the side walls of the roof will be gone, giving even more space for maybe some smaller lockers. My guess is that (at least for the full beam cabins) the small windows behind the doors will also be gone, as better insulation is direly needed for MAN long distance trucks and most drivers did not like them anyway. Whether or not the cabin is placed slightly higher than on the previous model is hard to tell. My guess is that there still will be the small engine tunnel in its floor, so it might probably be in the same position. The front bumper will be styled differently, helping to reduce injury in case of collision with people. The blue lines illustrate what the shape of the headlights and grilles might look like, guessing from the lines that are visible underneath the camouflage. The lower side panel of the door is not finished yet. This will either be shorter (illustrated by the red line) to follow the lines of the redesigned lower part of the side fenders on the back of the cabin. Or it might be longer, almost completely covering the first entry step. The side indicator (next to the front wheel), which is still from the previous model in this picture, will most likely be replaced with a more modern one. Effects of both Scania and MAN belonging to Volkswagen, or the Traton group as their truck and bus business is now called, can already be seen on the exteriour of this truck. When looking at the illuminated headlights (see small picture in lower left corner) these strongly resemble the headlights of the new generation Scania trucks. They might not be completely identical, but to me it is obvious that both are an outcome of the same engineering. Also, the spoilers on the front corners of the cabin will most likely be replaced with short flaps (illustrated in yellow) guiding the air around the corners and improving aerodynamics. The cabin in the picture still carries the front side spoilers of the existing model as well, but that might very well be just camouflage. Together with the supposed bottom line of the lower side panels, the look of the cabin will orientate a bit towards a slightly forward leaning design, known from the new generation Scania and (to a somewhat greater extend) from the Volvo FH. The idea of these short flaps was also first seen on Scania trucks – on the last edition (named “Streamline”) of the previous generation Scania trucks. The mirrors seem to be unchanged on the truck in the picture. My guess is that a camera system will be available for the new model, at least as an option. 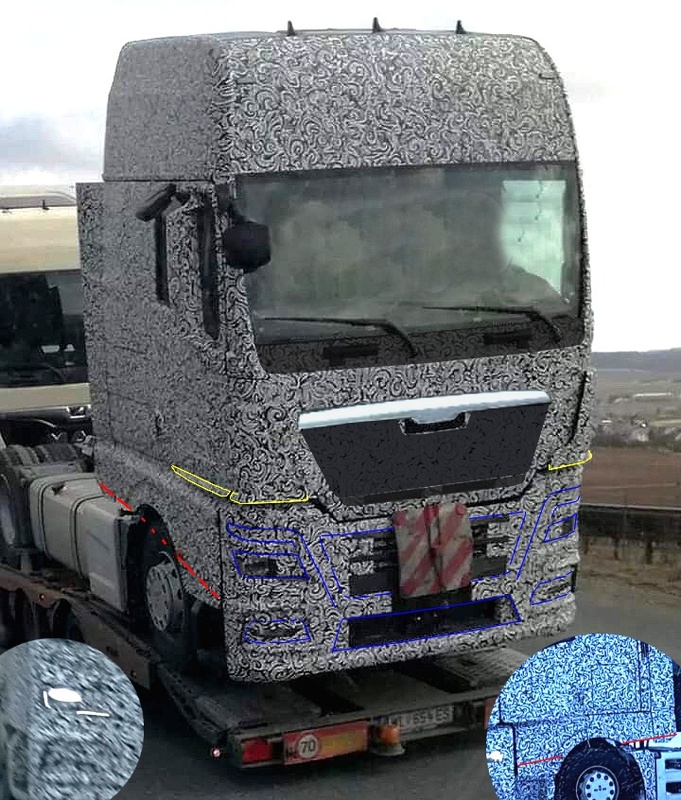 Currently there is a lot of development going on in this area, as well as with corner scan systems that will automatically stop the truck when going around a corner and a person is detected in the blind spot area. 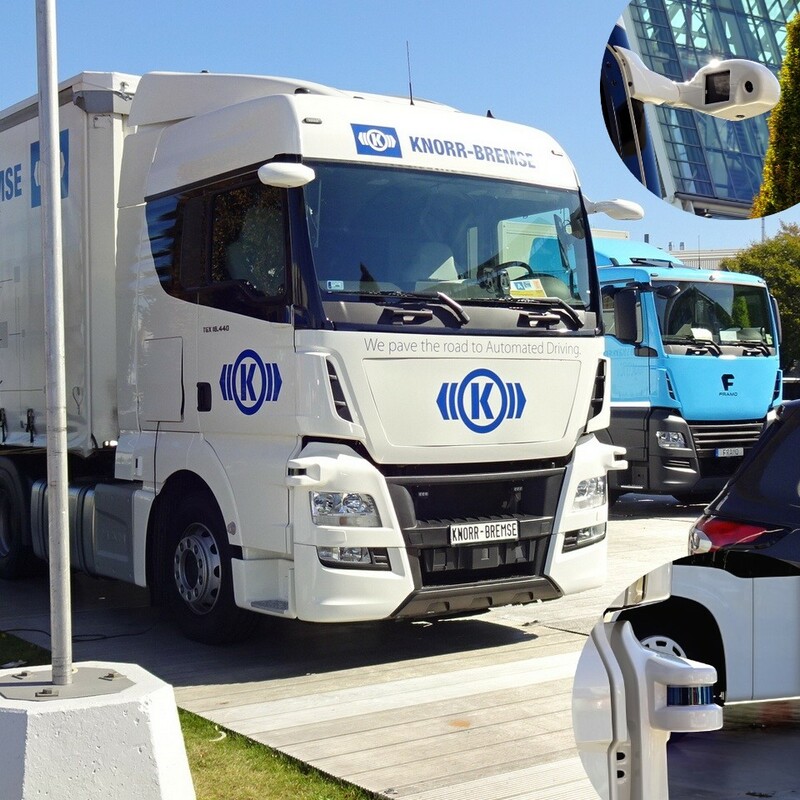 See picture below, showing a test truck of Knorr Bremse, taken on last year’s IAA in Hanover.